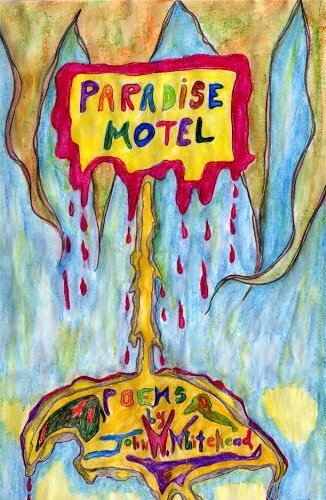 Ana Mardoll's Ramblings: Author Interview: John Whitehead on "Paradise Motel"
Author Interview: John Whitehead on "Paradise Motel"
Ana: Today we have John Whitehead introducing their debut book of poetry and illustrations, "Paradise Motel". I haven't read this book myself, but John was kind enough to agree to guest blog about their book to any readers who might be interested in the subject. John, how would you describe your novel to your prospective readers? In broad terms, what is your novel about? John: "Paradise Motel" is an exploration of reality. The question I always ask is, “How can we know what reality is?” which feeds into the question of whether or not the material world is all that there is. I don’t believe it is all there is. Is there a spiritual dimension? Is there a non-physical dimension that operates behind people and the universe? That’s how I’d describe it. It’s an attempt to describe the way I see the universe as the interacting of various dimensions and non-material planes with materiality. John: The theme that I’m trying to aim for is “What is truth? How can we know reality? Is there something beyond physical reality?” Of course, I believe that there is. I would agree with the great thinkers such as Albert Einstein and Carl Jung and others that there is an overarching Mind, with a capital M, and we are part of that. The question is always “Who created what?” Some people argue that our minds created the universe, other argue that something created our minds and we’re part of that. What I’m trying to look at is what is it that is there? We don’t really know. I think you make a mistake if you believe that everything ends at the shopping mall, in other words, materialism. The present state of materialism, and I state this in the book, is the enemy of spirituality and the ultimate search for truth. I hope it will make people think about something besides what they see on a daily basis. There are numerous studies being done by various universities, professors, and scientists on whether consciousness survives death and whether or not near death experiences are real. And there are thousands of case studies that seem to indicate that something survives death. And I hope that people think about, what happens to them when they die, should they live this life in a better way? My answer to that would be, yeah, we should live this life filled with love and compassion for one another. And move away from the murderous world around us where, on a daily basis, people, animals, and plants are destroyed wantonly. And I would hope that reading something like this would force people to question how they live their life. John: My great influences in terms of poetry were T.S. Eliot and Dylan Thomas and as far as painting goes, Francis Bacon, Salvador Dali, and Picasso. One person who had a tremendous impact on me is Rod Serling, the great award-winning writer of Broadway plays. He wrote the Twilight Zone. He emphasized how important writing was and how writing should touch on moral issues. Everything Serling wrote touched on morality and how we should live our lives. He was always questioning what people were doing, especially the state and the government. John: I don’t think anything occurs in a vacuum. What I’ve written is influenced by all the people I’ve mentioned. If I could be Dylan Thomas or Francis Bacon, I would, but I can’t. There’s a lot of originality in what I do, but it’s greatly influenced in all those who have come before me. Anybody that appreciates writers who wrote about the dark side of human nature and tried to uplift people beyond where they are would appreciate this book. John: I have published more than 30 books, mostly dealing with legal or religious matters, so this is new for me. However, the poems are not new. Many of them were written over a period of years. The illustrations are ones I created primarily over the past year. As for the future, I have several books in the works, both fiction and nonfiction, including a graphic novel, which will be another new venture for me—but is proving to be a lot of fun. John: People can get copies of Paradise Motel from online booksellers such as Amazon, Barnes and Noble, Smashwords, iTunes, etc. I can be reached at johnw@rutherford.org or on my Facebook page. Ana: Thank you, John. I understand you have the first chapter of your novel available as an excerpt for interested readers? And is there anything else you wish to add for our readers? John: A reader recently asked me whether there was a particular reason for the religious imagery in my poetry—there are many allusions to Biblical stories and images of angels, demons, and God—or whether religion just factors heavily into my worldview. It was a good question and an important one, I think. Think of Francis Bacon, a strident atheist who drew the Crucifixion over and over. Three Studies for Figures at the Base of a Crucifixion is one of the greatest paintings of all time. He was fascinated with the Crucifixion, and I think that is a search for meaning. What gives us meaning? That’s what the poetry is about. We’re finite beings and I think the question is always, “Do we need an infinite reference point to give us coherence and meaning?” That’s the debate between atheists and religious people, no matter what the religion is. What gives us meaning? Most people would say an infinite reference point, whatever that is. A sample of "Paradise Motel" is available on Smashwords. If you can pass some constructive criticism to the author, he should try to be more specific in defining what his novel is about and what subjects he touches. Despite the way you tried to get him to just tell us what his novel is about 3 or 4 times using questions with different approaches, I still don't know what this book is about, and I wouldn't buy a book without even a little idea of what I'll be reading.